On Sunday, my phone vibrated with a breaking news alert. 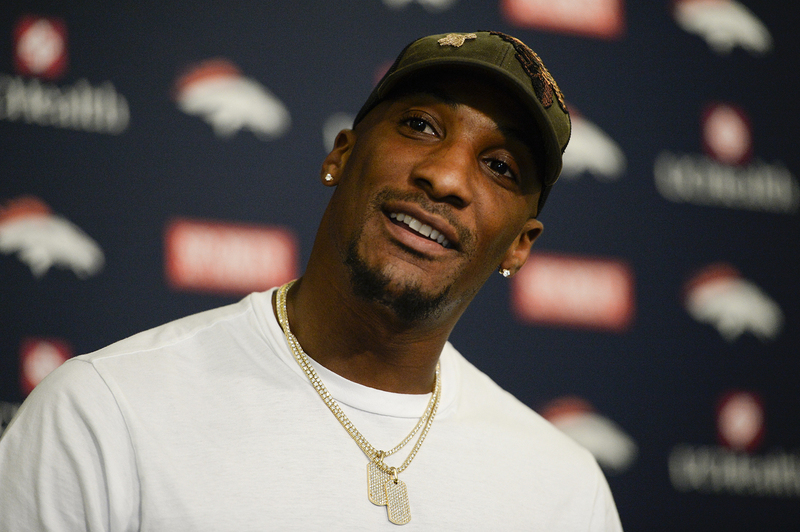 “Denver Broncos Cornerback Aqib Talib shot at a Dallas nightclub.” My heart pumped ice water for one beat, my chest and spine went cold for a split second. Then my heart started to race. It felt like my nervous system was responding to a ghost jumping out of my phone. In a way, I guess it was. Unintentionally, with only my tone, I conveyed a tinge of judgment and anger. Once I read the article linked in the alert, I was pleased to learn it appeared that Talib would be OK. But frankly, his well-being was not what dominated my mind. Though I read Talib’s name in the alert, I am not sure it registered. Denver Broncos Aqib Talib addresses the media during a news conference April 18 at the UCHealth Training Facility as he attends the offseason workout program. For me, the words “Denver Broncos Cornerback Shot” flashed like a marquee, rendering the name “Aqib Talib” invisible and irrelevant. Seeing “Denver Broncos Cornerback Shot” triggered an immediate emotional and visceral response. Those words, “Denver Broncos Cornerback Shot” hijacked my mind. I thought of one of the more painful and formative experiences of my adult life. I thought of New Year’s Day 2007. I thought of my friend and teammate Darrent Williams, Denver Broncos Cornerback shot. And killed. I met Darrent a couple of days after we were both drafted by the Denver Broncos in the 2005 NFL draft. He was selected in the second round; I went in the third. Days before the draft, the Broncos swapped several draft picks with Washington, leaving the Broncos without a first-round pick in 2005, making Darrent the prized new addition. With the newly acquired first-round pick, Washington selected Auburn quarterback Jason Campbell, one spot after the Green Bay Packers selected Aaron Rodgers. Following the draft, the Broncos flew in all of their first-day selections for a news conference. I shared a car from the airport to the Broncos’ practice facility with Ohio State running back Maurice Clarett and his lawyer, who felt the need to share that he once was Tupac Shakur and Snoop Dogg’s lawyer. Minutes before we met the Denver media, Clarett and I were guided to a room where the other draft picks waited. Darrent extended his hand, inviting dap, and introduced himself, “D-Will.” Our palms clapped, we leaned in for a quick one-arm hug, I replied, “Fox.” Completing the final stage of dap, we hooked our fingers and pulled them apart, creating a snap, to which D-Will said, “already,” a Texas slang meant to express agreement, excitement, determination. As roommates through training camp and the preseason, we developed a bond through uncommonly honest hotel-room conversations and shared ambition. At the start of training camp, we were the cornerbacks on the second unit, behind Lenny Walls and Champ Bailey. Our consistently strong performance during camp impressed the coaches, fans and media. We turned heads at practices during the day, and at night we bad-mouthed all the corners drafted before us. During the regular season, we sustained our reliable play, sharing the right cornerback duties opposite Champ, the future Hall of Famer. We both continued to impress, earning leaguewide recognition. We were sharing a unique journey. We were “the rookie corners.” When we were recognized around Denver, fans would frequently call us by each other’s name. The team finished 13-3 and earned a first-round bye. In the second round, we beat quarterback Tom Brady and the New England Patriots. But we lost in the AFC Championship Game to the eventual Super Bowl champion Pittsburgh Steelers. We were expected to win that game. I was devastated. Not only did we lose, but I didn’t play well. That made for a tough offseason, and I spent most of it at the practice facility working to get ready for the next season. 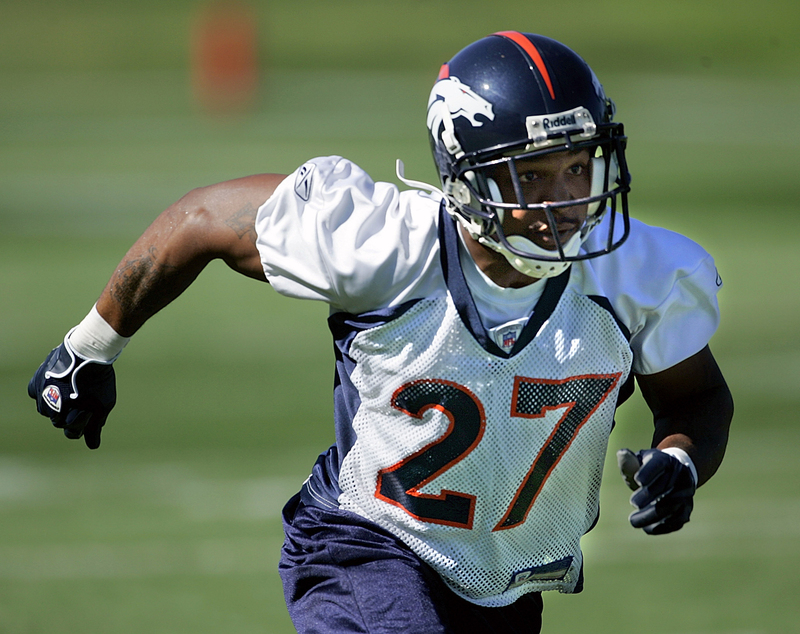 Denver Broncos rookie cornerback Darrent Williams from Oklahoma State, runs through a drill during training camp on July 29, 2005, in Denver. Going in the next season, it was clear that D-Will and I would be competing for the job at right cornerback. D-Will won that role. But, because of nagging injuries to both D-Will and Champ, I played a lot. I even learned to play safety to get on the field more. On Dec. 31, 2006, I headed to the team breakfast before our game against the San Francisco 49ers. It was week 17, but for us, the playoffs had already started. If we defeated the 49ers, we would be in the playoffs. I was starting that game. Intensely focused, I sat alone eating breakfast, determined to play well and win. Displaying a 23-year-old’s lack of perspective, I remember thinking that losing to the 49ers was the worst thing that could happen that day. I didn’t know how wrong I would be. In a bleak coincidence, immediately after that game Thomas Herrion, an offensive tackle for the 49ers, collapsed and died in the locker room. Herrion, like D-Will, was from Fort Worth, Texas. I don’t remember much about the game, except that we lost in overtime. The worst had happened. My girlfriend was in town for the weekend and we had a short dinner at Del Frisco’s Double Eagle Steakhouse after the game. The sting of the loss dulled. We laughed while heading home so early on New Year’s Eve. When we got to my house, we joked that it was already New Year’s Day on the East Coast, so we wouldn’t be lame for going to bed before the clock struck midnight in Denver. In the first few hours of 2007, I woke to my ringing cellphone. The screen read “Champ.” He had become one of my closest friends on the team. Not only was he the best defensive player in the league, he was also an unnecessarily generous and kind person. Case in point. One year earlier, we beat the Chargers in San Diego, capping our stellar 13-3 regular season. In the locker room, Champ said, “Let’s go to Vegas.” While the rest of the team took the team plane back to Denver, I ate shrimp cocktail on a private jet. I felt like I was living a movie. I went from sitting in the cramped visitors’ locker room at Qualcomm Stadium to standing on couches at a Vegas rooftop nightclub, next to singer Brittany Spears’ table, counting down the seconds before 2006. 3 … 2 … 1 … the club erupted with cheers: “Happy New Year.” It was a cool moment. Fireworks exploding in the distance, while people sprayed champagne. Unfortunately, a year later, the spraying of champagne caused a different kind of fireworks. Looking at “Champ” on my phone in my pitch-black Denver bedroom, I quickly realized something was wrong. “Maybe he needs me to pick him up,” I thought as I lifted the phone to my ear. “Darrent was shot,” he replied. He told me the name of the hospital. Again, I felt like I was in a movie. My girlfriend and I drove silently to the hospital. At the hospital, I walked into a room full of crying people, some in bloodstained clothes. Seeing his friends from Fort Worth sent my mind back to our rookie year conversations, when he told me about his kids, his future, and the challenges he has overcome. At the hospital I felt a deep sympathy for his friends and family. The idea that his mother, fiancée and children would never see him again dominated my thoughts. I didn’t begin to feel my own pain until I got home later that morning. I would never see him again. He was my friend. We walked a parallel path. The hurt struck me suddenly and forcefully. I cried a lot over the next several days and months. Too weak to continue the cool guy facade I was constructing to impress my girlfriend, I cried and we talked. I had never been that vulnerable with a girlfriend before then and I never had another girlfriend after her. Years later, she became my wife. When writing my list of wedding guests, I jotted down names of old Broncos teammates. Darrent entered my thoughts. Some people say that losing someone feels like you lost a part of you, and I guess that is true. But, instead of his absence, I felt a presence. Darrent’s death injured me, tearing the fabric of my identity. Similar to the aftereffects of the torn hip, knee, and shoulder ligaments I suffered on the field, the ache of Darrent’s death exists in me at all times, like an emotional arthritis that flares during intense experiences. I feel pain as I reach milestones in my career and life. No matter how joyous the occasion, I could not help but to think about my friend, who was robbed of those moments. As I wrote my wedding invitation list, I imagined attending Darrent’s wedding. By then, he would be the top cornerback for the Dallas Cowboys. In my mind, his wedding would have been extravagant and flashy, like he was on the field. His hair cornrowed on the sides, but on top, sporting the “cornrow-hawk” he originated. Going into the season after Darrent’s death, the Broncos brought in Pro Bowl cornerback Dre Bly to start in the position I assumed would be mine. It was a public declaration that the team did not believe in me. Rumors surfaced that the team was trying to trade me. I should have been offended by this, but I didn’t care. It seemed insignificant. As a tribute to D-Will, “Already” became our team’s motto that season. I resented that because it felt as if we were reducing Darrent’s life and death to a marketing slogan. Looking back, that was probably unfair, because I would have been angry if the team hadn’t acknowledged Darrent in some grand way. 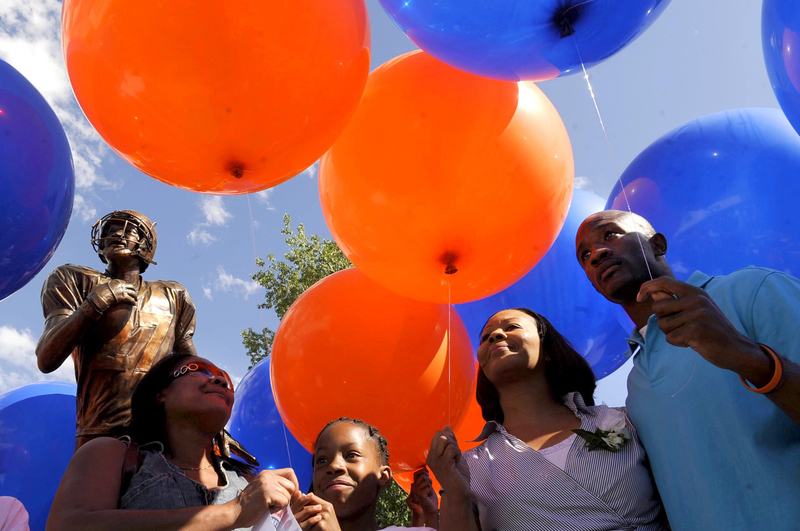 Rosalind Williams, (second from right), the mother of Darrent Williams, and Dominique Foxworth, a Denver Broncos player and good friend of Darrent Williams, (right), prepare to let go of 27 blue and orange balloons in honor of Darrent Williams. 27 was the number of his jersey. The Darrent Williams Memorial Teen Center officially opened today in front of most of Darrent Williams’ family. Cousins, aunts, nephews and nieces all flew in from Texas to join in the festivities surrounding the opening of the new center, which is attached to the Boys & Girls Clubs of Metro Denver at 4397 Crown Blvd in Montbello. It will be a center only for teens that offers a variety of activities for them. Also on hand were many of the Denver Broncos players, coach Mike Shanahan and owner Pat Bowlen. Outside of the center is a large, lifesize bronze statue of Darrent Williams. Denver Broncos player Darrent Williams was killed New Year’s Eve 2007 by a gunshot wound. The shooter has never been found. In my time away from football, I focused on raising money to build a teen center in honor of Darrent at the Boys & Girls Club. And I spent one day a week helping out at the Boys & Girls Club. I told people it was therapeutic. It wasn’t. As much as I loved those kids, I felt no less sad when I was there. I smiled big at the grand opening of the teen center while I stood under an enormous statue of D-Will and lied to news cameras about how great it felt to know that something great came from the death of Darrent Williams. I entered the 2007 season with a significantly muted affection for football. Losing did not feel as bad, and winning did not feel as good. We had a disappointing 7-9 season. Two months after the final regular-season game, Damien Nash, another Denver Bronco teammate, collapsed and died after playing in a charity basketball game. I was traded to the Atlanta Falcons before the start of the 2008 season. I was sad to leave Denver, and to this day, I love Colorado and feel a unique affection for the Broncos. But leaving was probably the best thing for me. At the bottom of the depth chart, living alone in a Georgia hotel, I thought about Darrent a lot. And I still think about him regularly, maybe not as often. He always floats into my mind at important junctures in my life. And then sometimes, he jumps in out of nowhere, like the news alert the other day. Until this week, I have not read anything about Darrent’s death. This week, I went back and read everything about the night Darrent was killed. It was painful. The tear in my identity has healed over the years, but it left a scar that influences who I am and the way in which I live my life.